Some people give up on the idea of paying off debt because they think they don't earn enough money. Yes, life can be expensive, especially when wages don't keep pace with the cost of living. We're all victims of the tough economy, but this doesn't mean we can't win the war against consumer debt. If you talk with anyone who's successfully paid off debt, you'll likely notice a common thread: Commitment. While these folks may not be rich or have a ton of money, what they do have is an air-tight spending plan, and they know exactly where their money is going. To get a handle on debt, you first have to get a handle on your budget and monitor your spending. 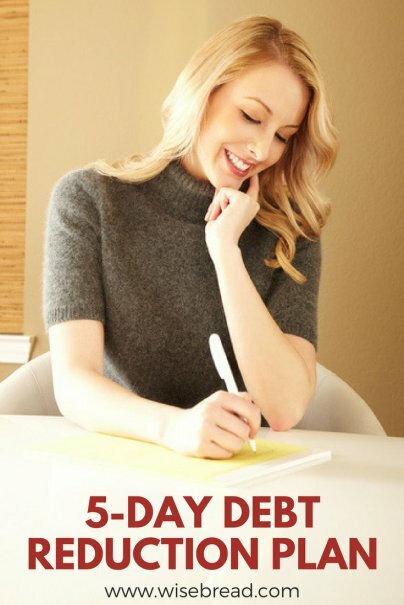 Like adding up your debt, you'll need to write it all down rather than relying on your own estimates. There's a good chance that you're spending more than you think you are in many categories. In fact, "financial advisers who press clients to tally their spending say the numbers are often at least 20% higher than the individuals had thought," according to the Wall Street Journal. ...and many more, including a simple spreadsheet. These apps are effective because they allow you track income and expenses, and you're able to see what you're spending on a daily, weekly, or monthly basis. Some budgeting apps also include pie charts and graphs so you know the percentage of your income that's spent in different categories. When you see where your money goes, it's easier to identify areas where you need to cut back. It can be hard to account for every cent when you first begin, but if you're following along with the series, on Day Two you collected all of your recent credit card statements, which is a good place to start. If you're at a loss for spending details, go ahead and make estimates now, and create a spending book and track every penny you spend (every one!) for a month. You can update the estimates you make today afterward. Group your expenses into two categories: Fixed and Variable. Fixed means you can't change it (immediately). For example, these might include your mortgage, car payments, and insurance. The other expenses are variable, which means that you can adjust them easily, for example groceries, dining, and even subscriptions like Hulu or Netflix (you can cancel them or lower the subscription level at any time). If you're overspending on a fixed monthly expense like a house or car, you can't get rid of those expenses overnight. But depending on how much debt you're in, how quickly you want to get out of it, and whether you've suddenly realized you've been living outside of your means, you should consider downsizing or even moving to a different city. But in the meantime, take a hard look at your variable expenses and start cutting. As we saw in Day 2: Add It Up, if you want to get rid of your $10,000 in credit card debt in two years, you'll need to allocate $500 per month toward debt repayment. If you're currently paying $200 a month, rework your budget to free up an additional $300 every month. This breaks down to about $75 per week. Here are some ideas about how you can drum up that extra cash. Reduce your weekly grocery budget. You can save money by skipping the brand names and buying generic and by planning meals based on the weekly sales. Use a credit card that offers rewards for groceries and always bring a list and stick to it! Cut back on entertainment. If you're currently spending $40 a week on entertainment, which might include movies, dinner, and drinks with friends, scale back to $30 a week. Something as simple as ordering water instead of a soda or iced tea can save you $5-$10 each week. Travel mug and brown bag it. So what if you have to brew your own coffee or brown bag your lunch? You'll be glad you made the sacrifice as your debt starts to disappear. Cut your home entertainment spend. Instead of subscribing to Netflix and Hulu, pick one and cancel the other. Or keep both streaming services and get rid of cable. Cancel your gym membership. Instead, work out at home or at the park, or join a nearby recreation center, like the YMCA. Cut car expenses. Carpool, walk, or bike to work a few days each week to save on gas and reduce your transportation costs. I did this for a couple years with a buddy and it saved us both thousands of dollars. Shop around for cheaper insurance. If you don't drive often, ask your provider about a low-mileage discount. You can also save by bundling insurances with the same company. As you can see, improving your cashflow isn't hard or impossible, but it does require action. If you can cut $10, $20, or even $30 here and there, the savings can add up to hundreds every month. Once you have a solid savings plan in place, you can finally begin redirecting found dollars toward debt repayment. The other part of your budget includes the money you have coming in. The more you make, the more you can allocate to your debt reduction. Often it's easier to get a side gig to get the extra money than to cut costs. Here are ways you can increase your income (make sure you're putting in all that extra money into your credit card payments!). Ask for a raise. Consider whether it's an appropriate time to ask for a raise. Has the company been doing well? Have you been with the company for a while and have gotten positive feedback regarding your performance? Don't be shy. The worse that can happen is your boss will say "no." Get a side job. There's a whole online gig economy out there. Find something you can do. Do it. Sell your stuff. We all have things sitting in our garage or the back of the closet that haven't seen the light of day in years. Go through them and see what you can sell. Better yet, if you're crafty, start making stuff to sell. Sell your services. Think about your skillset and consider whether others may find it valuable. Find places to showcase your skills and get some exposure. Be a host. You don't have to have multiple homes lying around to make money renting out your property. You can rent out a room, a couch, even a parking space. You can also host a foreign exchange student. Be creative. You don't have to have a lot of extra time or fancy skills to make some extra cash. Take online surveys or spend a few hours a week on micro job sites. Look around for opportunities. In part four, I'll discuss some strategies that will make the most of your hard-earned money and get you to financial independence faster. In my area (DFW), the YMCA is more expensive than some of the chain gyms. It's $40 for a single adult membership.